Peroral endoscopic myotomy with fundoplication: are we there yet! Peroral endoscopic myotomy (POEM) has revolutionized the endoscopic management of achalasia cardia. 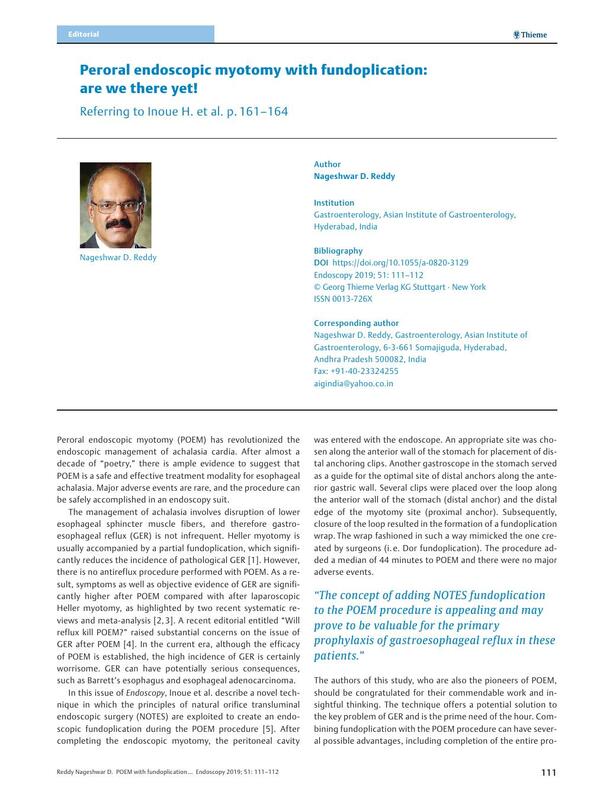 After almost a decade of “poetry,” there is ample evidence to suggest that POEM is a safe and effective treatment modality for esophageal achalasia. Major adverse events are rare, and the procedure can be safely accomplished in an endoscopy suit. The management of achalasia involves disruption of lower esophageal sphincter muscle fibers, and therefore gastroesophageal reflux (GER) is not infrequent. Heller myotomy is usually accompanied by a partial fundoplication, which significantly reduces the incidence of pathological GER . However, there is no antireflux procedure performed with POEM. As a result, symptoms as well as objective evidence of GER are significantly higher after POEM compared with after laparoscopic Heller myotomy, as highlighted by two recent systematic reviews and meta-analysis  . A recent editorial entitled “Will reflux kill POEM?” raised substantial concerns on the issue of GER after POEM . In the current era, although the efficacy of POEM is established, the high incidence of GER is certainly worrisome. GER can have potentially serious consequences, such as Barrett’s esophagus and esophageal adenocarcinoma. In this issue of Endoscopy, Inoue et al. describe a novel technique in which the principles of natural orifice transluminal endoscopic surgery (NOTES) are exploited to create an endoscopic fundoplication during the POEM procedure . After completing the endoscopic myotomy, the peritoneal cavity was entered with the endoscope. An appropriate site was chosen along the anterior wall of the stomach for placement of distal anchoring clips. Another gastroscope in the stomach served as a guide for the optimal site of distal anchors along the anterior gastric wall. Several clips were placed over the loop along the anterior wall of the stomach (distal anchor) and the distal edge of the myotomy site (proximal anchor). Subsequently, closure of the loop resulted in the formation of a fundoplication wrap. The wrap fashioned in such a way mimicked the one created by surgeons (i. e. Dor fundoplication). The procedure added a median of 44 minutes to POEM and there were no major adverse events. The authors of this study, who are also the pioneers of POEM, should be congratulated for their commendable work and insightful thinking. The technique offers a potential solution to the key problem of GER and is the prime need of the hour. Combining fundoplication with the POEM procedure can have several possible advantages, including completion of the entire procedure endoscopically during the primary POEM procedure and no requirement for any special equipment or accessories.